Combining a groovy vinyl look with the rugged quality and performance of Verbatim CD-R technology comes Digital Vinyl CD-R, a recordable disc designed after the popular 45-rpm record format. Impossible to ignore, these attention-getters are a great way to save delicate LP collections, make a standout business presentation or simply burn your personal music mix. The 80min/700MB color-coded discs deliver superior write performance and broad read compatibility using Verbatim’s patented Azo technology. Each disc comes protected by a special dual-layer coating that safeguards data for years to come. 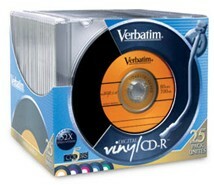 Vinyl CD-R discs are compatible with Microboards tower duplicators.